Status: In Stock or Presale. Release Date: Friday, April 5, 2019. 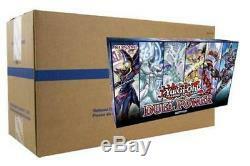 Yugioh Duel Power Booster Set 12-Box Factory Sealed Case. Duel Power celebrates Spring 2019 by rolling together a new 100-card Ultra Rare booster set (including 40 brand-new cards) alongside new Ultra Rare variant artwork of every Yu-Gi-Oh! This listing is for (1) factory sealed 12-box case, each box has 6 booster packs, each pack has 5 random Ultra Rare cards from the 100-card master set. Celebrates Spring 2019 by rolling together a new 100-card Ultra Rare booster set (including 40 brand-new cards) alongside new Ultra Rare variant artwork of every Yu-Gi-Oh! TV series ace monster (from Dark Magician to Decode Talker), and a new double-sided Gameboard celebrating Yu-Gi-Oh! Contains 6 new Duel Power booster packs with 5 Ultra Rare cards per pack. Duel Powers booster set includes 40 new cards and 60 hot reprints, including the 4 popular "discard" effect monsters (from Ghost Ogre & Snow Rabbit to Ghost Belle & Haunted Mansion); popular Spells and Traps like Infinite Impermanence, Card of Demise, and Evenly Matched; Link Monsters from Borreload Dragon to Trickstar Holly Angel; and out-of-print cards like Naturia Beast, High Priestess of Prophecy, and 2015s "Nekroz" Ritual Monsters. S new cards span the whole history of Yu-Gi-Oh! By revisiting the main monsters from each anime series history. Start with powered-up versions of your Dark Magician like Magician of Chaos (a new Dark Magician Ritual Monster). Use Cyber Dragon Nachster to power up your most famous Machines from the GX era. Revisit high-speed Duel Wheeling from 5Ds with the brand-new Synchro Monster Signal Warrior. Flood your field with Xyz Materials using the new Zexal-themed Utopic Onomatopeia and Xyz Summon Number 39: Utopia Double. Pump up your ARC-V Pendulum Deck with Odd-Eyes Advance Dragon to burn your opponents Life Points and Summon back more monsters. And finally, for the latest anime series, Yu-Gi-Oh! VRAINS Decks get new cards like Gouki Cage Match, Trickstar Foxglove Witch, and Booster Dragon. Besides new cards for Decks directly seen on TV, Duel Power also provides new cards for favorites old AND new from the Yu-Gi-Oh! TCG tournament scene, like Platinum Gadget, Thunder Dragon Thunderstormech, Beat Cop from the Underworld, Hieratic Seal of the Heavenly Spheres, Aromaseraphy Jasmine, Security Dragon, and Crowley, the First Propheseer. Anime series is your favorite. And the more of it you like, the more youll find in this special commemorative booster set! Box contains: 6 Duel Power booster packs, each with 5 Ultra Rare cards per pack 6 new Ultra Rare variant art cards, showing off new art versions of the main monsters from each Yu-Gi-Oh! Anime series (Dark Magician, Elemental HERO Neos, Stardust Dragon, Number 39: Utopia, Odd-Eyes Pendulum Dragon, and Decode Talker), and 1 Gameboard. If there is no stamp, the item is likely using Calculated. If you preorder, your original tracking ID will automatically update by Release Date. If your preorder tracking information has not updated before Release Date, please wait for Release Date. Before you preorder, Please be sure to read the large red box describing in detail your preorder Arrival Date estimates. Question: How come my offer was Declined, or Declined without a Counteroffer? Answer: Our prices are usually already at or near the lowest market prices for single units, therefore most Offers for single units are automatically declined regardless of the Offer Amount. If the market price later rises or falls we will not adjust prices up or down, all sales are final. Heavy cases and fragile items are double boxed with inner padding included. We can't resolve problems we don't know about. If an item arrives and you have any doubts as to if its contents are damaged etc, do not open the item, if you do, it is at your own risk. Rather, take and send pictures of the unopened item(s) and packaging so the appropriate cases can be filed for Return & Replacement as needed. If you open or use a unit for any reason, it is no longer eligible for return. Your item is automatically insured! Depending on the item, we can sometimes be very flexible with our pricing discounts. The item "Yugioh Duel Power Booster Set 12-Box Factory Sealed Case" is in sale since Friday, February 1, 2019. This item is in the category "Toys & Hobbies\Collectible Card Games\Yu-Gi-Oh! The seller is "sportsandmore" and is located in United States.